In my last post I’d hooked up a TFT screen to an FPGA dev board and got some simple driver software running on the ZPUFlex CPU core. While it worked, having the CPU spoonfeed a frame of video data, byte-by-byte over an SPI link isn’t ideal, so I implemented a DMA process to handle the hard work. 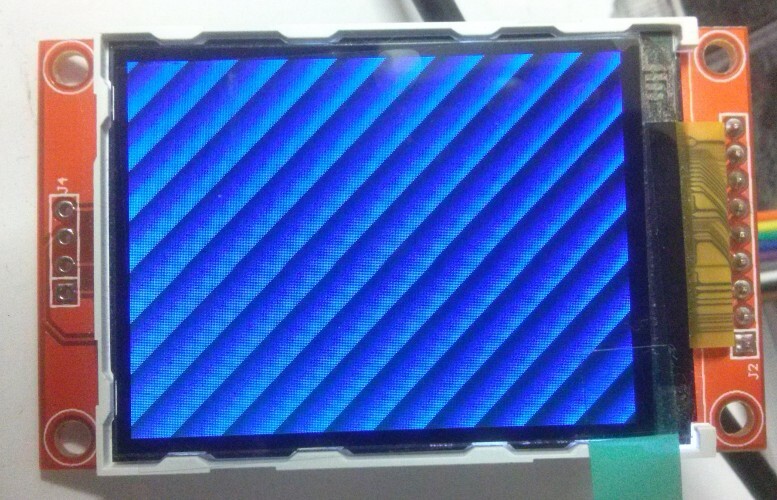 A few months ago I bought a cheap 2.2 inch TFT screen on EBay but never managed to find the time to get it working, so today I dusted it off, and hooked it up to a nice little Cyclone IV dev board I bought some months previously. I’m pleased to report that the first prototype of the PSOC4-based Sega 6-button pad to Amiga CD32 adapter is now up and running. In the process I’ve learned a lot about the PSOC4 platform, and I have to say as a development platform I really like it – I have no doubt I shall be using these devices in future projects. 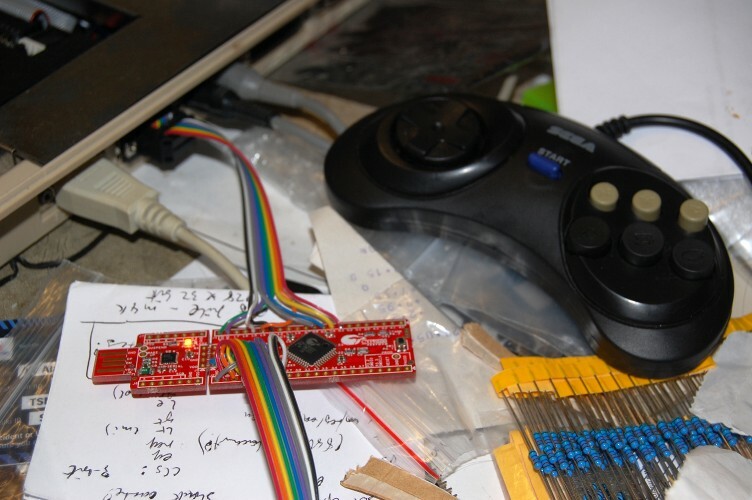 I’ve finally got round to wiring up the prototype Sega 6-button to CD32 joypad adapter – here it is connected to an A500. Well…. nearly! Directions and the first two fire buttons are fine, but the shift register still needs debugging. In my earlier post I mentioned that I was going to handle reading the Sega 6-button joypad in software, using an interrupt routine, and use programmable logic to handle masquerading as a CD32 pad. The six inputs from the Sega pad (up, down, left, right, button1, button2) are mapped to PSOC pins P2.0 to P2.5. Since these are adjacent, we can read and write to them easily as a single entity. We create a “pins” component with six inputs, named Sega_Inputs, and PSOC creator automatically generate headers and stubs so that we can read their status in main.c simply by calling Sega_Inputs_Read(). Similarly, we create an output pin, Sega_Select on pin P2.6, which we can write in the code using Sega_Select_Write(). One of the projects I have in mind for the PSOC4 chip on the CY8CKIT-049-42xx boards I picked up recently is an adapter to allow 6-button Sega Megadrive controllers to be used on the Amiga. I already made such a device a couple of years ago using a PIC microcontroller but never finished the project (I discovered FPGAs round about then!) and the programmable digital blocks in the PSOC4 make it an ideal platform for resurrecting the project. Initially I shall read the Sega pad in software, using an interrupt routine, then implement the CD32-pad shift register using the programmable hardware in the PSOC4. The original Sega Megadrive gamepad had four buttons: A, B, C and Start. The pad used a standard Atari-style 9-pin DSUB connector, and while the four directions and button B were mapped using standard Atari wiring (pins 1,2,3,4,6), button C appeared on pin 9. Most Atari-like gameport connectors have +5v available on pin 7, but the Sega variant has +5v on pin 5. Instead, pin 7 is used as a select signal, which multiplexes the pins normally occupied by the B and C buttons. When the select signal is high, B & C are readable, and when the select signal is low, the status of buttons A and Start appear on those lines instead. When it came to adding extra buttons to the six button pad, Sega needed to find a way of multiplexing extra buttons in such a way that they didn’t cause compatibility issues. The obvious solution of making extra buttons replace the direction lines when the select signal is low wasn’t possible because the existing 3-button protocol already held the left and right lines low when select was low, presumably so software could distinguish the 3-button pad from a standard Atari-style joystick or Master System controller. Instead they went with a “magic knock” approach, in which software toggles the select line four times in quick succession. The new buttons appear on the directions during the high pulse following the third low pulse, and to identify the pad as a six button button, the direction lines are low and high for the low pulses before and after this, respectively. In the few months since I started playing around with the zpu_small core, expanding it into what ultimately became ZPUFlex, my variant of the CPU has gone from being an interesting experiment to something that might actually see some usefulness in other projects. ZPUFlex was intended from the outset to be configurable and flexible, but this comes at the cost of complexity, and there are a number of competing factors to consider when configuring the CPU. The following is an attempt to document some of the choices that must be made when using ZPUFlex.